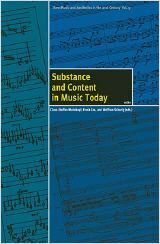 Content and substance (Gehalt) in music is the difficult theme of this volume. The central questions are the following: in what manner is music more than immanence, structure, and autonomous meaning, and to what degree do "extramusical" ideas and conceptions shape the work so that more appears to be in it than music alone. 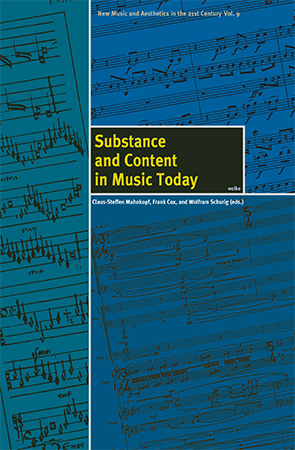 This theme is above all relevant for contemporary music of the twenty-first century, as ever more composers are interested both in cultural discourse and in a content-orientation for their music. How they approach such themes varies widely. The present volume presents essays by Mark Barden, Dániel Péter Biró, Frank Cox, Suzanne Farrin, Wieland Hoban, Claus-Steffen Mahnkopf, Timothy McCormack, Kai Johannes Polzhofer, Wolfram Schurig, Hannes Seidl, Steven Kazuo Takasugi, and Ming Tsao. All of these composers were invited to ponder the relationship between musical structure and the substance of music in light of their own musical practices.